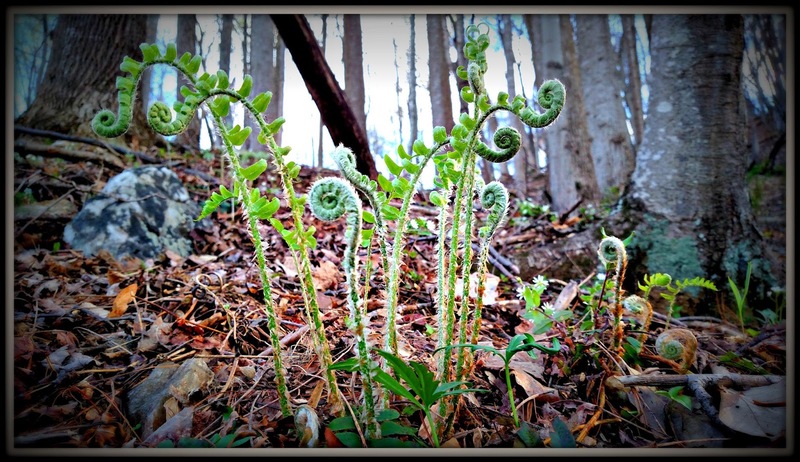 This is the time of year when fiddlehead ferns start popping up all over our land. You can see where they get their name. For a plant, they're marvelously cute this time of year. You can eat them (but need to cook them first, and peel off the crinkly stuff). They are supposed to taste like asparagus. Once they unfurl, they are inedible, so there is a narrow window of time for you to be whipping up crème de fiddlehead soup. I'm thinking about roasting some up for dinner one night. I bet the boys will get a kick out of it! I boiled them and felt it was better to eat asparagus, have a back up veggie.Fun to try new things.I have been eating a lot of walleye. That critter in my last post is a ground squirrel that lives under my patio. It is well fed, I just got a sack of shell peanuts yesterday for the two of us.It fills its cheeks like a chipmunk. We had a lot of these in the woods at one of our previous homes. I think they are so pretty. I did not know you could eat them. Let us know if you and the boys have some for dinner! they remind me of snails. lol so cute and very interesting! I've never eaten them. But I do admire their spring beauty. Good post. They're pretty! I bet they would be fun to eat too if they stay furled after cooking. That's interesting that once they unfurl, they're not edible. Wonder what happens to them? They are lovely. I had no idea you could eat them! I've never seen them before. They are so neat! I love things in nature. it always surprises me how many edible plants are growing right in our yard. I haven't tried many of them, but I think it is great to know what they are. We have one or two ferns in our small woodland, but not enough to harvest. It is fascinating to try new food, especially plants which are growing 'wild'. We have ferns everywhere we look.. We would not know the difference of what kind to eat. This is so new to me! Beautiful image! I've never eaten them. I didn't know they were edible! We have these ferns too, but I didn't know their name, and I certainly didn't know they were edible... I'd be afraid I'd miss the window of opportunity to eat them. What fun! We're expecting snow tonight. On top of the crocus.